For one-semester courses in microcomputer accounting. Designed for students familiar with the essentials of the accounting cycle and how it relates to business, QuickBooks® Desktop 2018: A Complete Course is a comprehensive instructional must have learning resource. The 17th Edition provides training using the QuickBooks Premier Accountant 2018 accounting program. This text covers using QuickBooks in a service business, a merchandising business, a sole proprietorship, and a partnership. Preparing payroll and creating a new company are also included. No prior knowledge of, or experience with computers, Microsoft® Windows®, or QuickBooks® is required. Step-by-step tutorial-style training helps students develop confidence in recording business transactions for service and inventory businesses -- from simple to complex -- that simulate real-world occurrences. The Intuit’s Test Drive Company helps students drill, practice, and explore transaction analysis and entry. Extensive assignment material is available to instructors to test students’ knowledge. QuickBooks® screenshots, completed transactions, and reports help students visually conceptualize accounting concepts. After thorough instruction and usage of QuickBooks Online Plus within the text, students should be able to transition from training to using the program in an actual business. Throughout the text, the emphasis has been placed on the use of QuickBooks Online Plus’ innovative approach to recording accounting transactions based on a business form rather than using the traditional journal format. This approach has been correlated to traditional accounting through adjusting entries, end-of-period procedures, and use of the behind-the-scenes journal. QuickBooks® Desktop 2018: A Complete Course lets students download the software and use it at their convenience. Janet Horne received her master of science in business administration and bachelor of science in business education from California State University, Long Beach and has spent her educational career teaching business and computer applications courses. The majority of her teaching career has been at Los Angeles Pierce College. Where, in addition to being a full-time professor, she was the Computer Applications and Office Technologies Department Chairperson, served on many committees, and developed new programs. Horne has been a presenter at many educational meetings and seminars and has been involved with a variety of professional organizations. Horne’s quest to find a textbook to use in teaching QuickBooks® led her to write one of the first texts for QuickBooks. As technologies change, it is important to work within the new technological environments. 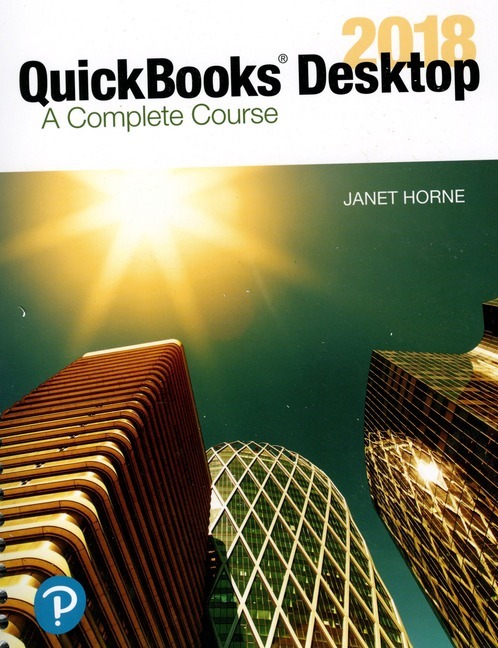 Other textbooks by Horne include several editions of QuickBooks: A Complete Course (uses QuickBooks Desktop Accountant software), QuickBooks Pro: Simplified, QuickBooks Pro: An Introduction, Peachtree Complete Accounting, Getting Started with QuickBooks Pro, and Computerized Accounting with CA-Simply Accounting. Horne is also the author of Runners Corporation and A-1 Photography accounting practice sets.